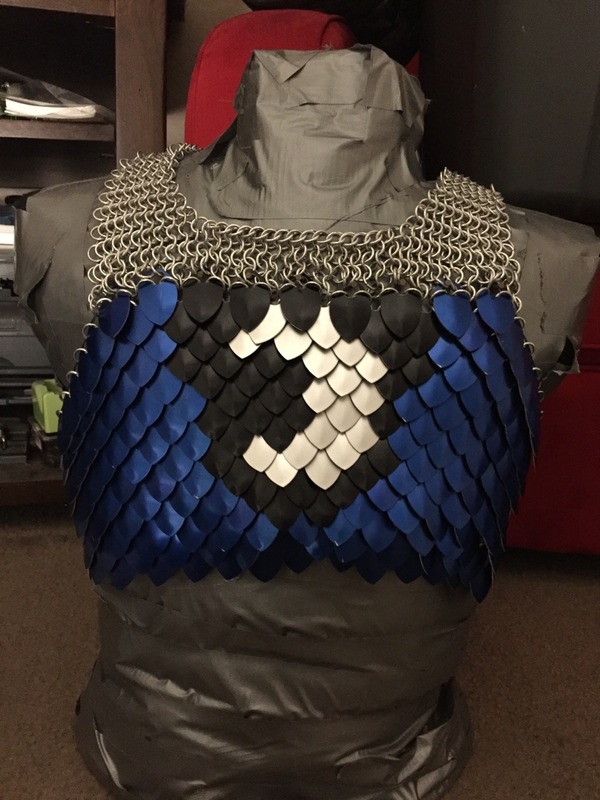 My first scale maille shirt - any help? Hey guys. I'm new to this site. After stumbling around blindly for a few months planning this project, I thought I'd post here to show my progress and ask for advice on techniques along the way. I started off my design with a basic sketch, that I drew over myself, to get an idea of where the panels would lay, how much would be scales, how much would be maille, that sort of thing. I then went into a website, lairoftheraven's scale maille inlay designer, and started drawing up plans. Which brought me to putting together my first panel, which has taken me four days to assemble. I have a google drive folder with more images, including my sketches and drawings. However, most of these pictures are a bit large and I'd like to be courteous and keep the post length down, so there they are. My main problem I'm facing right now is I need a way to attach european 4-1 chain maille to the scale maille in a strong, reliable manner. I'm using 5/16th 16g aluminum rings and large anodized aluminum scales for this project, as I didn't want to deal with some of the bits I've heard about split rings, like how sharp the edges are, as well as out of convenience not having to purchase a new pair of pliers. What's the best way for me to attach it? I need to hang the maille vertical, and attach it on the top and sides of the scale panel. Any advice? 90 degree links will do it. On your mail panel, two rings will go through each ring on top of your scale panel. For the sides of the scale panel add the rings to the outside edges. Two rings on the scale panel will go through each ring of your mail panel. I have a scale suit underway with panels that will be attached using a series of 90 degree links. Sorry for terse reply, happened to lurk just before bed. If my description doesn't make sense, look for October 2017 post about 90 degree 4 in 1. I added a pic of mail shirt using that method. Application is pretty much identical for scales. Just imagine hanging open panel in pic is your scale panel. Thanks for the advice! I went through and examined my scale maille, and the gaps in it means that I think I'll only be able to join the maille 45 degrees of vertical, on the faces of the panel. I can attach it at the sides no problem now. However, the triangular portion on top is much more difficult to solve. The height difference between the rings as far as I"m aware isn't regular enough to allow me to hang rings oriented perfectly vertical. As far as I'm aware, this means I'll have to weave my shirt at a 45 degree angle. Is there any way for me to space and weave my links to allow it to hang completely vertical like a typical shirt? Alright, I did a quick patch showing how to work with the diagonal scales and a hanging closed mail panel. There are 7 scales, 6 in a pyramid, 1 hanging below as if it was the outer straight edge. If you weave the tip and edges in full 4in1, it will help with both stabilizing the panels of scales and linking them to the mail. If you're having trouble following what is happening, just start with a row of 4in1 3 rings tall and wide enough to cover your panel of scales. Link two rings to the top scale and your strip and then finish the row. The first ring of the next row down will attach to one of the rings that went through your scale, the ring next to it, and the ring linking your two scales together on the diagonal. Then finish the row across. Keep in mind, the rings alternate which way they lay with every row and you will have to pay attention to that if you are working with separate panels you want to attach together later. If they don't line up, you will be tearing out a lot of work along with the hair on your head. Thanks, your method is a lot more stable than the mess I was trying to figure out! I was trying to build a 1 tall sheet of horizontally hung maille around the scales, and rotate that 90 degrees. Which didn't account for the difference in height of the scales. I didn't think to weave it into the scale holes. I'll post an update once I get this panel done, then I'll start the second. Those two panels will eat up probably a good two thirds of the body, aside from the scale chest and shoulders. I should hopefully only have to make 4-5 square feet of maille for that, to bridge the gaps between the panels. There's no such thing as a fast or easy hauberk. But it feels like I'm making progress already, and that's really motivating. Paladin, what size scales and rings are in your images of closed-hand E4-1 to scales tests? I'd like to know as well, I'm facing some serious confusion with this weave. Those are the large stainless steel scales and 16 gauge 5/16 inch stainless steel rings. Believe it or not, even with nine completed byrnie - haubergeon sized pieces and roughly an equal number of other smaller, misc. items over the last seven or eight years, I still have not worked with any of the other sizes for these scales. Finally an update to my armor! This is what I have done so far. I definitely faced some confusion with the joining technique between the two weaves, although using @Paladin's image gallery and posts, I managed to find a way to join them. It's not entirely ideal or matches his technique, but this was easy enough for me to replicate and integrate into the maille. I wove rings into the collar to create half Persian 3-1 strands to stabilize it atop the maille and scale maille, and right now I'm grinding out units of chain maille to make the back and armpits of my shirt. As soon as I'll do this, I'm going to start work on the sleeves, which are going to be scale and share the same inlay design as the chest, and then finally attach the side armor panels I made, and fill in the front and back. After that it's a matter of extending the front and back of the shirt down a bit more, and possibly adding some fancier details there. Forgive me if it's wrong to double post, I thought I'd keep adding more updates. As I get more done, I'm noticing that I'm starting to have more questions as well. 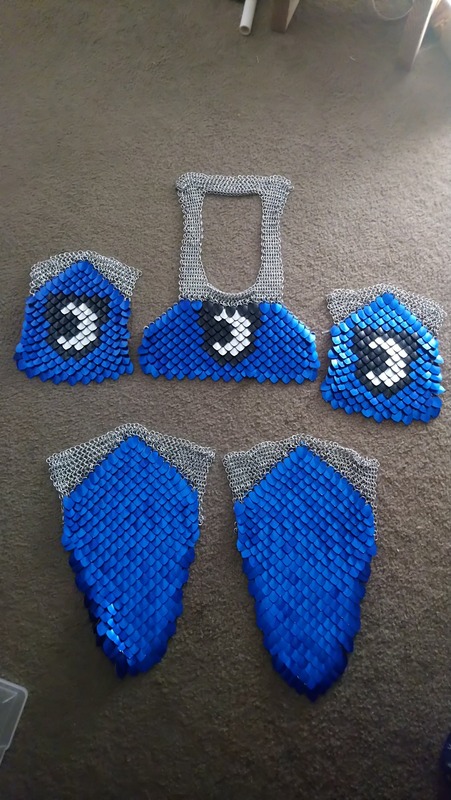 I finished all of my scale armor panels for my suit of armor! 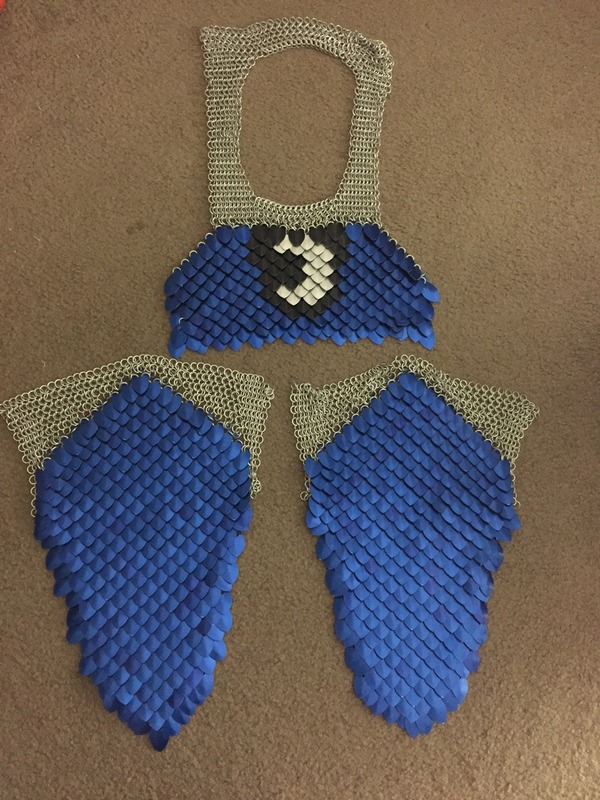 After this, I finished weaving the maille for the back and sides of the chest armor, and I've attached the side panels to it as well. 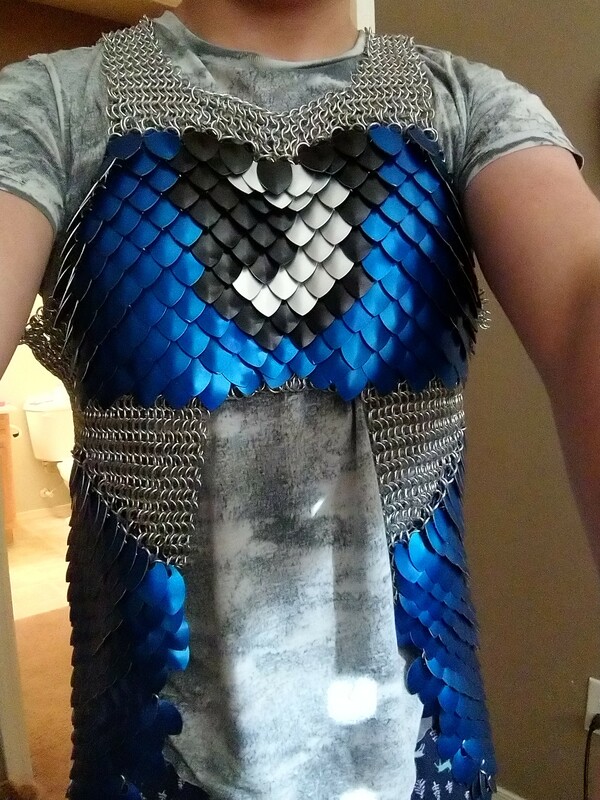 So now my armor is fully wearable! I'm still not entirely sure how to handle the shoulder holes, or the contractions for the front and back of my armor. All I know is I have to bring it in from about a 36 inch chest (72 units of maille) to a 32 inch waist, or about 64 units. I can probably also cut out a unit or two to account for the flexibility of the weave, I don't want too much slack. 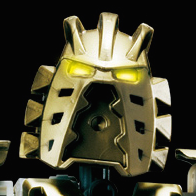 The gap on the back of the armor is 18 units wide, and the front is 8 that need to be filled. After that, I need to finish the sleeves on the scale shoulder panels, and attach those. Then it's a matter of finishing up the front and back portions below the waist, so that it's more akin to a hauberk than it is a haubergeon. I purchased some blue anodized aluminum rings and have been working on making diamond inlay designs that I can integrate into those pieces, for a bit more visual interest than is currently present in the chain maille portions. I might try and see about making some larger designs and shapes that I can incorporate into the contractions for the chest and back. The portions below the waist in the front and back are going to almost be like the tails of a coat, extending down from between the scale maille portions, edged in half Persian 3-1. Then after that, I still have a pair of greaves and vambraces to worry about, as well as a cloak, underclothing, and boots for my full suit of armor.